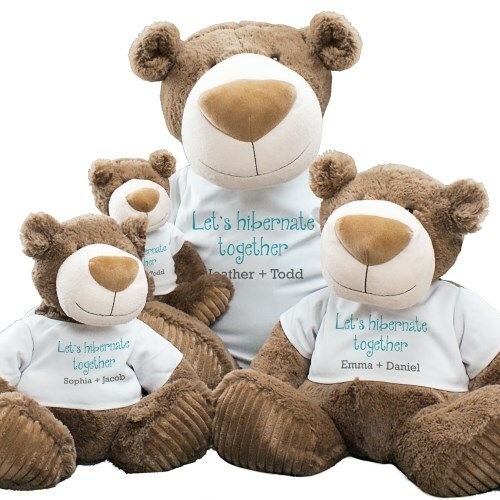 Ask your sweetheart to be your number one snuggling pal with our “Let’s Hibernate Together” Teddy Bear. This design is featured on our Mocha Teddy Bear from the Aurora collection. Mocha has an adorable smile and a soft, cuddly feel. This teddy bear is available at 12", 15", 20", and 30". Mocha features a big smile and a modernistic, oversize nose. His brown color exterior is enjoyably soft and the corduroy pads on his plush feet offer a velvety texture. Mocha wears a t-shirt that may be customized with any two names for free. Free gift wrapping and a free gift message are also included to create a thoughtful presentation. Additional Details Looking for the perfect gift for your boyfriend or girlfriend? Look through our Valentine's Bears and Romance plush animals to find the stuffed animal that shows your love.